Earlier we described how court appointment of an impartial provisional director was no longer available by statute in Georgia for deadlocked boards of “garden variety” profit corporations. (But it is available for both Georgia non-profit corporations, and for Georgia statutory close corporations.) Now it is time to discuss a statutory remedy that is simple and powerful, and available to shareholders of Georgia profit corporations; judicial dissolution. At an impasse? 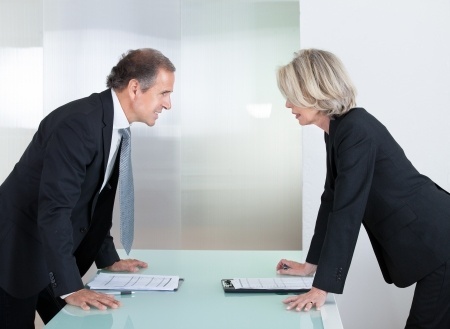 Not getting along with your corporate business “partner” or fellow shareholder? Can’t find a way to talk about the disagreements, much less resolve them? Judicial dissolution of your corporation may be where you are headed. The unhappy shareholder who petitions, naturally bears the burden of proving one or more of these alternate grounds by a standard of “more likely than not”. Because of the consequences, both intended and not, dissolution are so far reaching, the mere filing of a petition based on these grounds may be enough to start discussions among quarreling shareholders. Because inevitably, and depending on the facts, one party always has more to lose than the other, and that means power. Next we will look at statutory receivership in similar situations.